A young girl appears to be okay after jumping from the second floor of the Gateway Borough Recreation Center. 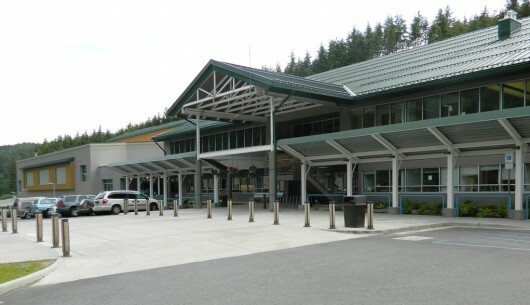 According to a press release issued by the Ketchikan Gateway Borough Manager’s Office, on Wednesday a 12-year-old girl and her caregiver went to the recreation center to participate in drop-in activities. At approximately 2:45 p.m., staff learned that the girl had climbed over the railing on the second floor track, sat on the score clock and jumped to the first floor gymnasium. Staff immediately called 9-1-1 and provided initial care until EMTs arrived. The girl was transported to PeaceHealth Ketchikan Medical Center and was conscious upon arrival. The caregiver contacted the child’s parent and met the child at the hospital. Citing confidentiality, the Borough will not release the name of the girl or the caregiver agency. The press release states that this is the first incident of this nature to occur at the Gateway Recreation Center since it opened 22 years ago. Staff plans to meet with the caregiver agency to review and assess the incident.